The Tallgrass Journal has temporaily discontinued publication. Tallgrass Journal - Download the last Tall Grass Journal Issue. A very limited number of copies are available at the visitors center. We publish quarterly. Supt. Snow review of 1st year at GLP. Summer - Event Flyers and Archaeology Article. Summer - Events and Updates. Summer - Events Flyers Summer -Preserving our past. When we enter our homes from the outside we usually do not think of the past. We are surrounded by modern technology and conveniences. Cross the threshold of Lincoln’s home and we think not of the present but of the past. The Cragg cabin located at Goose Lake Prairie State Natural Area similarly evokes thoughts of the past. The Cragg cabin was originally constructed in the 1830’s and stood for 100 years before it was moved and underwent extensive repairs. Over the years the cabin has undergone additional rebuilding phases and was eventually moved to its current location at the state park. Does the cabin resemble the original Cragg cabin in all its details constructed over 170 years ago? It probably does not. However, is an accurate representation of the physical qualities of the cabin most important or is the message conveyed by the cabin more significant. For me, the past is not a place; it is a state of mind. neighborhood and the house looked in the mid-1800s. Historic rehabilitation and reconstruction is tricky. One always tries to maintain as much of the original look as possible. Unfortunately many factors can make it difficult to adhere to 100 percent historical accuracy. When the Cragg cabin was again rebuilt and moved to its current location, the participants meant to create something that would have provided the visitor with a sense of the past. Despite some problems with its appearances, the Cragg cabin still conveys a strong sense of the past for the visitor. Walking into the Cragg cabin or even seeing it from afar, the visitor is immediately presented with thoughts about the past. Comparisons are made between old and new technology. Comforts we take for granted are even more relished when faced with the harsher conditions which probably existed based on the timber framing illustrated in the Cragg cabin. As the archaeologist for the Illinois Department of Natural Resources it is my responsibility to ensure that the Department protects it’s archaeological sites and significant standing structures so they are preserved for the future. Once protected, a structure can be interpreted for the public. Good interpretation will then enhance visitor appreciation for the resource. A well informed public with appreciation for historic resources will inevitability lead to increase protection and broader public support for historic preservation. Public involvement in moving and reconstructing the Cragg cabin is particularly rewarding when younger people are involved. The participants take with them an appreciation for historic preservation, while presenting the visitor a window into the past. The region surrounding the Goose Lake Prairie State Natural Area was settled later than other areas in Illinois. Nonetheless the conditions faced by those first settlers were harsh and difficult. Building materials were gleaned from the natural environment and houses were built using skills and techniques less common today. There is no question that a visitor to the Cragg cabin will come away with some sense that life was different 170 years ago. In the end I think that is what is most important. Reflecting upon the past and what it means can be triggered by old photographs, stories, or the physical presence of old buildings. The Cragg cabin speaks to us about early settlers and lost technologies. See Our history page for more information on the Cragg Cabin. Hal Hasson has been the Illinois Department of Natural Resources Archaeologist for 21 years. His job is to overlook all the archaeological sites and significant structures (houses, barns, bridges, and canals) owned by DNR across the entire state. Mr. Hasson has a Ph.D. in Anthropology from the University of Wisconsin-Milwaukee. He last visited Goose Lake Prairie State Natural Area in November 2010 to take a look at the Cragg Cabin. Posted June 29, 2011 from the Tallgrass Journal Summer, 2011 page 1,3. The deer hunting season at Goose Lake Prairie and the new Morris Wetlands was a great success this year! Of the 678 registered archery hunters for both sites there was a total of 20 bucks and 29 does killed on the Morris Wetlands alone according to the hunter fact sheets. We do not have the results for archery hunting at Goose Lake Prairie as of yet, but the numbers seemed to be good for the amount of guys who hunted it. The firearm season was exceptionally successful. Of the 822 hunters who hunted during the 5 firearm seasons we had 18 bucks and 26 does shot on the Morris Wetlands and 25 bucks and 25 does shot at Goose Lake Prairie/Heidecke Lake. The program was not only a success for the hunters, but the biologists and forester as well. The large numbers harvested will greatly aid in controlling the overabundant population which was devastating the trees the Illinois Department of Transportation had planted to help mitigate the Morris Wetlands. however, by doing so you are allowing for one of the other 678 registered hunters to also use the area. The waterfowl hunting at Heidecke Lake was mediocre this year. Due to an early onset of cold weather that held fast the lake remained closed for a good portion of the season due to the ice. Of the 35 days hunted the following numbers were harvested. Canada Geese- 13, Mallards- 290, Black Ducks- 12, Blue Winged Teal- 2, Green Winged Teal- 7, Hooded Merganser- 11, Common Merganser- 9, Red Breasted Merganser- 1, Goldeneye- 125, Ruddy- 4, Scaup- 19, Bufflehead- 20, Shovelers- 28, Ring-necked- 29, Redhead- 9, Canvasback- 3, Gadwall- 29, Pintail- 2, Wigeon- 2, and Other- 1. Overall it was a good, safe hunting season at Goose Lake Prairie, Heidecke Lake and the Morris Wetlands. We hope to have another successful and safe season in 2011-2012. Posted August 9, 2011. This article appeared in the Winter (January) 2011 issue on page 8. Fire is an essential component of the tallgrass prairie; it keeps invading trees and shrubs at bay, controls non-native species, makes nutrients more readily available to prairie plants, and promotes diversity in both the prairie plant community and wildlife habitat structure. Fire was a natural component of the pre-settlement landscape of Illinois, and Goose Lake Prairie is almost entirely dependent upon it. Without fire, Goose Lake Prairie would become an impenetrable woody thicket in a matter of a few decades. Pulling off a controlled burn at Goose Lake Prairie is no small feat. This site is one of the trickiest in the state, due to its sheer size and fuel type (burn managers refer to a site’s combustible vegetation as “fuel”). Tallgrass prairie fuels can easily produce flame heights of 40 feet and taller. An experienced crew of certified burn managers is required to safely conduct a prescribed fire at Goose Lake Prairie. The fire boss assembles a burn crew from the region, usually comprised of 8-15 individuals (depending on the complexity of the burn), all equipped with fire-resistant Nomex suits and wildland fire-fighting equipment. There are a minimum of 4 all-terrain vehicles, each rigged with 50 gallons of water, 200 feet of hose, and a high-pressure pump. Hand tools such as drip torches, rakes, flappers, and 5-gallon backpack sprayers are also required on each fire. A back-up water supply of several hundreds of gallons is also on site. Goose Lake Prairie is divided into multiple burn units easily denoted by the mown strips. Some units are only 40 acres, whereas other units may be over 600 acres in size. Most burn managers do not burn 100% of the natural area in one season; there should always be unburned vegetation to serve as a refuge for insects and other wildlife. It is also desirable to have diversity in the habitat structure of a large grassland to accommodate the variety of nesting grassland birds. Some birds, like the Henslow’s Sparrow, prefer a thick accumulation of grasses, and other birds such as the Grasshopper Sparrow, are more abundant after a recent burn. The site’s biologists rotate burn units, and usually try to burn a couple units each year at larger sites, as weather permits. The burn unit is defined by its firebreaks, which can be natural features or man-made. At Goose Lake Prairie, the burn units are designed using mowed trails, roads, and bodies of water. The burn crew begins at the downwind side of the burn unit by lighting the fuel (dried prairie vegetation) at the edge of the unit immediately adjacent to a mowed trail or road. The fire spreads in all directions, but at varying rates, depending on wind speed and direction. The rapidly spreading downwind side of the fire is extinguished by spraying water and snuffing it out with hand tools, or simply when the fire reaches a firebreak with no fuels, like a road or open water. The upwind side of the fire is allowed to slowly creep into the wind, towards the middle of the burn unit (know as a “back-fire”). The fire boss evaluates the behavior of the fire while it is still small and easy to extinguish. If the fire is behaving as expected under the weather conditions and fuel type, the crew splits into two teams, heading in opposite directions. Each team uses drip torches to light along the firebreak, working with the wind and extinguishing the downwind flames along the firebreak. The fire within the unit is allowed to continue creeping upwind so the firebreak is widened by creating a “black line” of burned fuel. This is the most critical and time consuming element of conducting a controlled burn. The fire teams are in constant communication with each other while lighting the back-fire, and regularly monitor the weather. Temperature, humidity, wind speed, and wind direction can vary throughout the day and greatly influence fire behavior. The teams continue lighting along the edges of the fire unit, almost circling the unit, until it is time to make the turn where the wind will carry the head-fire. Both teams hold steady while the fire boss evaluates the width of the black line. As a general rule of thumb, the black line at the downwind side of the burn unit should be 3 times as wide as the tallest expected flame height. If there is plenty of black line, one or both of the teams are given the go-ahead to completely circle the unit and light the head-fire. As the two teams meet up again, flames roll over the prairie, consuming nearly everything in their path. The fire extinguishes itself when the head-fire is pushed by the wind into the back-fire, where there is no more fuel left to burn. This past fall was an exceptional season for conducting prescribed fire at Goose Lake Prairie (among other sites within the region). The weather was unusually warm and dry, with favorable winds keeping smoke off Pine Bluff Road. Two burns were conducted; both immediately north of Pine Bluff Road, and on either side of Jugtown Road. The western unit went exactly as planned. The eastern unit however, kept the burn crew working into the night. While back-burning and widening out the black line through a part of the east unit which is dominated by the non-native common reed (Phragmites australis), the fire had jumped the line. Phragmites is one of the most invasive plant species in our wetlands, and it can grow up to 10 feet tall. When dense stands of it ignite, flame heights can easily get up to 50 feet. During the back-burning portion of this prescribed fire, the super-heated air column above the burning Phragmites pushed a lit ember up and outside the burn unit. The burn crew quickly implemented the back-up plan which was discussed before the fire was even lit. They would allow any escaped fire to burn until it reached the open water of the wetlands located downwind. The wind was pushing the escaped head-fire straight for the wetlands, and fire crews had to contain only the flanking-fire, with flame heights of about 3-6 feet. When the controllable flanking-fire met up with the open water wetlands, the escaped fire would be extinguished. However, the fire boss decided additional resources were needed and contacted two local fire departments. Coal City and Morris Fire Departments were invaluable in providing the IDNR fire crew with extra water used in controlling the escaped fire, staging additional wildfire equipment, and keeping travel on Pine Bluff Road safe (some drivers have a tendency to watch a fire instead of the road!). After gaining control of the escaped fire, the burn crew needed to complete the prescribed fire within the rest of the original unit. The back-burning and widening the black line still needed to be completed. This slow process was made even slower due to cooling temperatures and rising humidity. The head-fire was eventually lit around 7 pm, and final mop-up wasn’t completed until after midnight. A fire at Goose Lake Prairie is always an impressive sight. Witnessing Goose Lake Prairie ablaze and glowing into the night was even more of an awe-inspiring spectacle. This is not the first time Kim Roman has written for the Tallgrass Journal. We welcome her articles. Kim is employed by the Illinois Nature Preserves Commission. Posted April 15, 2011from the Spring 2011 Tallgrass Journal. by Amy L. Campbell, M.S. Panicum virgatum L., or switchgrass, is a warm-season perennial grass species native to much of North America. Historically, it was a major component of tallgrass prairie ecosystems, although wild populations have declined in recent decades due to the loss of most of our native prairie range. Switchgrass can still be found in native prairie remnants, which are distinguished from other prairie systems by the lack of human disturbance or length of time since disturbance, and are presumed to contain the descendents of the once vast tallgrass communities. Over the last several decades, however, switchgrass has been selectively bred by the USDA and others for different purposes, most recently for use as a biofuel, and mass plantings are seemingly imminent in several central and Midwestern states. The potential impact of biofuel cultivars on wild relatives is, as yet, unknown. Switchgrass is naturally a range grass and has been fed upon by ruminants for centuries, but it became a focus of study for use as a forage crop by scientists in the early 1970’s. Backed by the USDA, agronomists selected individual switchgrass plants that possessed desirable traits, such as increased biomass, high digestibility, or better winter survival, perhaps reducing genetic variability and increasing homogeneity, compared to the wild forbears. Over the years, the USDA has released several switchgrass cultivars, each selected and/or bred for specific traits. 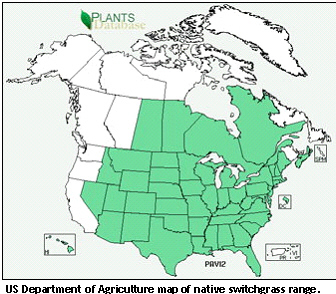 In the late 1980’s, switchgrass became one of several species of interest as a potential biofuel crop (biofuels, whether burned or converted to ethanol, are an attractive alternative to conventional fossil fuels because they are renewable and have the potential to be more economical and environmentally friendly than conventional fuels). 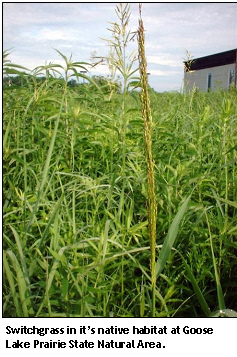 By the early 1990’s, researchers at the USDA and other groups, like Ceres, Inc., had determined that switchgrass had great potential as a biofuel and their research efforts, funded in large part by the Department of Energy, continue to look for ways to make ethanol conversion efficient and economical. Traits that were attractive in forage switchgrass are now being selected to a greater extent in biofuel switchgrass, which could further reduce genetic variability of the cultivar. Added to this is the fact that a few research groups are attempting to genetically modify switchgrass by inserting foreign genes, or “transgenes,” into the plant’s genome in order to increase the speed with which switchgrass becomes biofuel-ready. Genetic modification of switchgrass is not currently practiced by the USDA, who oversees the commercial release of cultivars. However, non-transgenic biofuel switchgrass appears to be on the verge of widespread plantings across several U.S. states. While the creation of a cleaner, more economical fuel is by no means objectionable per se, there is a lack of empirical scientific research about general switchgrass ecology, and virtually nothing is known about the potential impact of switchgrass cultivars on wild relatives. Some researchers and conservation groups have expressed concern that cultivars could escape cultivation and become a weedy invader or cross with wild relatives, producing hybrids that could dilute the native gene pool. Others believe that since forage cultivars were derived from wild ancestors and breeding cycles take years to complete, cultivars are not that far removed genetically from wild counterparts. However, there are very few scientific studies that have addressed these questions directly. Some ecologists have risen to the challenge and are trying to keep pace with agronomic research and development by addressing the more urgent questions related to switchgrass ecology. Researchers at universities such as Ohio State and Iowa State, for example, are collaborating to tackle some of these pressing questions. Hopefully soon, we will have good, empirical data that will shed light on any potential risks associated with biofuel cultivars, so we can make informed decisions about whether and where to plant biofuel switchgrass. Several remnant prairie patches exist in and around Grundy County, Illinois, and wild switchgrass populations can be found at Goose Lake Prairie, Midewin National Tallgrass Prairie, Des Plaines Conservation Area, Grant Creek Nature Preserve, and Hitt’s Siding Nature Preserve. While the switchgrass populations located in these prairie remnants are not large, they are nevertheless an important component of the remnant prairie community. Since we don’t really know what, if anything, will happen to wild populations when biofuel types are introduced, new research is vital to our increased understanding of this species. Amy L. Campbell, M.S. is a Ph.D. student studying plant ecology with Dr. Allison Snow at The Ohio State University in Columbus, Ohio. Amy has three main goals: to determine the potential for gene flow between cultivated and wild switchgrass populations, to investigate genetic similarity between the two groups, and to examine fitness-related traits as a measure of the potential invasiveness of cultivars in relation to wild counterparts. It is important to Amy’s work that she sample switchgrass individuals from truly wild populations (as opposed to restored areas). Luckily, Goose Lake State Park has a few true remnant prairie patches, which are becoming increasingly rare and, thus, harder to find. In 2009 and 2010, with the help of prairie specialist Art Rohr, Amy visited Goose Lake Prairie and collected leaf tissue and seeds from switchgrass individuals growing in the remnant prairie patches. She will use these samples in her research, and hopefully the information Amy discovers can be used as an important jumping-off point for future ecological studies about biofuel switchgrass. The Illinois Prairie: Feats of Clay. Our special article on Illinois Prairie History this month was written by Christopher Rollins. Chris is in his third year as Regional Land Manager, IDNR Region 2 and frequents Goose Lake Prairie SNA very often. Chris holds a double major in Animal Science; and Political Science and a Bachelor of Arts -Board of Governors’ Degree from Western Illinois University. Sunmer 2009 Issue of the Tallgrass Journal. I would like to offer my sincere thanks to everyone who offered words of thanks for the article I wrote for the last issue of the Tallgrass Journal. I really enjoyed and appreciated the opportunity to share some thoughts about the prairie. In the Prairie Partners I have discovered people with whom I have much in common: a love for the prairie, its history and its stories, and a thirst for knowledge and understanding of this unique environment. When I was asked by the indefatigable Ms. Susie Johnson to pen another article I leapt at the chance. As luck would have it, she had in mind that someone should write about the connection between prairies and wetlands. Since this is a topic which I have a more than passing personal interest in, I quickly agreed that I would address it and got down to the business of doing some research to flesh out what little I already knew. I found many fascinating facts relating specifically to the area in and around Goose Lake Prairie and the wetlands / prairie connect there. Permit me to take you on a journey through time to tell the story of the link between wetland and prairie. It begins about 300,000 to 132,000 years ago. It is the time of the Illinoian Stage. During the Illinoian Stage, the Laurentide ice sheet covered about 85 percent of Illinois. At its maximum, this huge glacier reached its southernmost extent in North America near Carbondale, Illinois. This ice sheet did what glaciers do – it moved and scoured the earth as it went. The action of the glacier changed the course of rivers and the topography of the landscape as it crept. And so it was with the fledgling beginnings of the Mississippi River. The Illinoian Stage blocked the Mississippi near Rock Island, diverting it into its present channel. After the glacier melted, the Illinois River flowed into the ancient channel. The Hennepin Canal roughly follows the ancient channel of the Mississippi upstream to Rock Island. The modern channel of the Illinois River was shaped in a matter of days by the Kankakee Torrent. During the melting of the Wisconsin Glacier, about 10,000 years ago, a lake formed in present-day Indiana, comparable to one of the modern Great Lakes. The lake formed behind the end moraine (an accumulation of boulders, stones, or other debris) of that glacier. Melting ice to the north eventually raised the level of the lake so that it overtopped the moraine. The dam burst, and the entire volume of the lake was released in a very short time, perhaps a few days. Because of the manner of its formation, the Illinois River runs through a deep canyon with many rock formations. It has what is called an "underutilized channel," one far larger than needed to contain any conceivable flow in modern times. The presence of Goose Lake Prairie in the Illinois River valley and its proximity to the river has historic, hydrographic, and geologic significance. Historically, we know that the Illinois River was important among Native Americans and early French traders as the principal water route connecting the Great Lakes with the Mississippi. The colonial settlements along the river formed the heart of the area known as the Illinois Country. After the construction of the Illinois and Michigan Canal and the Hennepin Canal in the 19th century, the river's role as link between Lake Michigan and the Mississippi was extended into the era of modern industrial shipping. Hydrographically, we know that The Illinois River is a principal tributary of the Mississippi River, approximately 273 miles long. The river drains a large section of central Illinois, with a drainage basin of 28,070 square miles. The Illinois River is formed by the confluence of the Kankakee and Des Plaines rivers in eastern Grundy County, approximately 10 miles southwest of Joliet – right in the backyard of Goose Lake Prairie. It flows west across northern Illinois, passing Morris and Ottawa, where it is joined by the Mazon River and Fox River. At LaSalle, it is joined by the Vermilion River, then flows west past Peru, and Spring Valley. In southeastern Bureau County it turns south at an area known as the "Great Bend," flowing southwest across western Illinois. Geologically, we know that sediment-laden floodwaters of the Kankakee Torrent and subsequent floods filled valleys with outwash incredibly quickly. In the glacial drift are found deposits of sand, gravel, and clay. As luck would have it, that "underutilized channel" mentioned earlier means that these ancient deposits are not swept away. Land elevation drops just 21 feet in the more than 200 miles from the head of the Illinois River to where the Illinois empties into the Mississippi. The river has so little energy that it cannot even carry away all the sediments dumped into it by its tributaries, much less sweep the valley of sediments deposited during its drastic glacial past. Prairie experts tell us that there are different kinds of prairie depending on the “moisture gradient” (differences in moisture between surface and subsurface readings) and soil type. And so at Goose Lake Prairie we are left with an area where black soil prairie is dominant. This is not the only possible type of prairie. There are also gravel prairies, dolomite prairies, sand prairies, and hill prairies. Prairies can be poorly drained and moist, or they can have average drainage conditions, or they can be well-drained and dry. Black soil prairie typically has a dark top soil up to 2' deep, which is rich in organic matter. Beneath this, there is clay subsoil that retains moisture and is rich in minerals. The lowest layer of subsoil is the mineral-rich glacial till that was left behind by the last glacier. It is typically a mixture of finely pulverized rocks, clay or sand, and loess (fine wind-borne debris). In Illinois, this layer of glacial till may easily exceed 200' before bedrock is reached. Because the soil retains significant moisture, even during the worst summer droughts, the roots of some prairie plants may extend 10-30' beneath the surface of the soil until the water table has been reached. Black soil prairies are usually moist during the spring when the rainfall amounts are higher and temperatures are cooler. The landscape of such prairies is rather flat and poorly drained because there has not been sufficient time (from the last glaciations) to develop an extensive drainage system, unlike hilly southern Illinois. Flat and poorly drained soil with clay subsoil + sources of water like flood and rain = wetlands. The boundaries of prairie wetlands may change as they tend to dry out near the soil surface during late summer because of hot temperatures and occasional summer droughts. The presence of wetlands makes for high biodiversity within the prairie landscape, and creates interesting and colorful places to visit during the growing season. From the historical perspective we know that the prairie / wetlands interface was common throughout our state. Consider that at least 60 percent of Illinois’ land area was once grassland of one type or another and prior to European settlement, wetlands covered millions of acres of Illinois, or about 23 percent of the land. So remember on your next visit to Goose Lake Prairie that a river ran through it, but a glacier came first, and together left us “feats of clay”. Clay played a major role in the history of Goose Lake Prairie – but that’s a topic for a future story! Thanks for reading, and enjoy the prairie! The Illinois Prairie: Lessons of history. Spring 2009 Issue of the Tallgrass Journal. At first glance the fast pace of our modern daily lives circa 2009 appears to have little in common with the lives of our forefathers here on the prairie nearly 160 years ago. On closer examination there are circumstances that ring familiar and can be more fully understood because of our recent history. During the 12 months ended July 1, 2005, one of the top-10 fastest-growing counties in the United States was Kendall, Illinois, which came in third at 9.4 percent growth. During the same period Grundy, Illinois, just missed the cut, ranking 11th. If you picked up a news paper during the last five years, it was hard to miss the reports of “unprecedented” growth in what have typically been largely rural areas of the state. While some of this growth has been attributed to an “overflow effect” of Chicago’s urban expansion, much of it can be attributed to people choosing a different way of life outside the urban center, simply seeking “a home they can call their own”. Let’s step into the time machine and visit the same area circa 1850. By the time the 1860 census was tallied, Illinois had grown to be the fourth most populated state in America. The rapid growth of Chicago was a major reason for the increase, but other areas of the state were growing independently. In 1849 more than 40% of the land in Illinois was owned by the federal government. This land was isolated and undeveloped located in areas without access to major transportation. By 1855, almost every acre of federal land had been purchased from the government for use as farmland. Farming was the fastest growing business in Illinois and Chicago was becoming a center for shipping farm products and livestock to the entire United States. By 1870, the total agricultural production of Illinois was second only to New York. Illinois held number one rank in corn, wheat, and swine production. Illinois was second only to Texas in beef cattle production and third to New York and Pennsylvania in the production of dairy cattle. Many forces combined to produce Illinois’ agricultural growth. The invention of new farm implements helped to turn vast amounts of prairie into farmland. The railroads made transportation faster and cheaper allowing Illinois farmers to ship their products to markets across the country. All of these things occurred at a time when the nation’s population was growing rapidly and needed what Illinois had to offer. Today, statistics tell us that more than 70 percent of all family farms and businesses do not survive through the second generation, and 87 percent don't make it to a third generation. Our great-grandparents, encouraged by easy credit, answered the siren’s song of the open plains as a land of fertile abundance where they might make a life for themselves and their families. They moved into the plains of Illinois in record numbers in the 1850’s and 60’s not knowing what waited three generations hence. As we look back through the lense of history, do we think of them as reckless? Do we hate Cyrus Hall McCormack for inventing the reaper? Do we loath an entrepreneurial blacksmith from Grand Detour, Illinois named John Deere for inventing the plow that broke the prairie? It seems that 160 years of history allow us sufficient perspective to appreciate the pioneering spirit of our ancestors and the beneficial gains of the agricultural revolution. In the future will we look back and find any benefit to the land boom of the early 2000’s? I would like to predict at least one: This will be remembered as a time of awakening and enlightenment of citizens to the importance of preserving open spaces – especially our vanishing prairies! You may have seen numerous nets in several marshes at Goose Lake prairie and asked yourself, what are those? Well, they are turtle traps. I have been trapping turtles, specifically Blanding’s turtles for two years now. Goose Lake prairie is one of the few places left in the state where there appears to be a thriving population, although their status is unknown. I have captured 57 Blanding’s turtles in 9 weeks of trapping over 2 years. In addition, around 70 painted turtles and a handful of common snapping turtles have also visited my nets. The next several years should paint a better picture of the status of Blanding’s turtles at Goose Lake prairie. Blanding’s turtles are a medium sized turtle, to about 10 inches long that inhabits shallow marshes with emergent vegetation, wet prairies, sloughs and bogs. 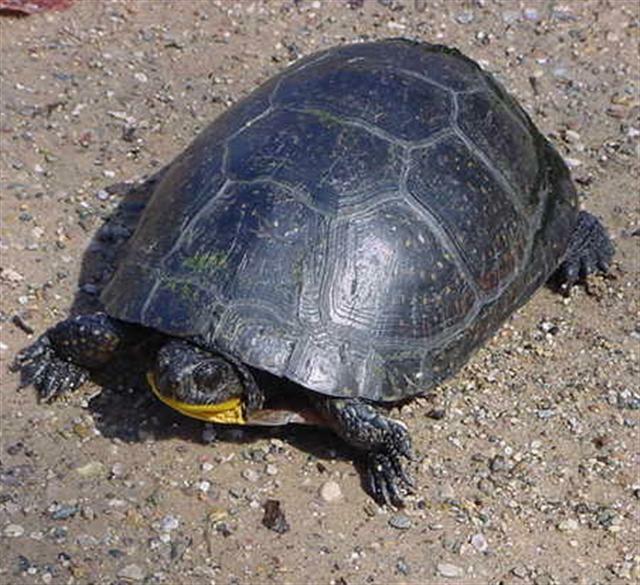 A dark shell speckled with numerous yellow spots and a bright yellow chin is the distinguishing characteristic. Blanding’s turtles were once common throughout its range, which extends from Nebraska eastward to southern Ontario, with disjunct populations in New York, New England, and Nova Scotia, while the Great Lakes region is the stronghold of the species. It is listed and endangered or threatened in 10 states and 2 Canadian provinces. The major problem facing Blanding’s turtle today, particularly in Illinois, is habitat fragmentation and destruction. Most of the wetlands and prairies, which Blanding’s turtles utilize, are gone from the Illinois landscape. Able to travel long distances overnight, these turtles need large contiguous blocks of grassland and a variety of wetlands in order to reproduce successfully. Goose Lake prairie is one of the few remaining sites in Illinois that is large enough and with appropriate habitat to support a viable population of Blanding’s turtles. Although they occur in many marshes throughout the Chicagoland area, populations consist mainly of old breeding adults. Once these long-lived species (up to 70 years) die the population crashes. Females are breeding but eggs rarely hatch, due to predators, and juvenile mortality is high. Without large areas of appropriate habitat required for successful reproduction Blanding’s turtles will continue to live on the edge.